Go to Alfredo e Ada’s of course! 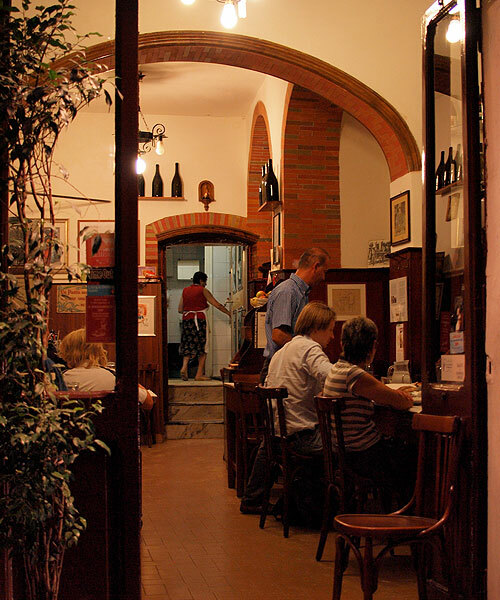 After our posh drink and snacks at Hotel Raphael we walked through the cobble-stoned and picturesque streets of Rome to Alfredo e Ada’s. I need to quickly brag that I read the map and got us there. I’m bragging because I’m extremely bad at reading maps and usually give up half way through in tears. But this time I persevered and got it right. A proud occasion for me! Our mate Douglas told us to ask for the red wine as soon as we sat down because it’s home made and better than the white wine they serve. He was right, it was delicious. 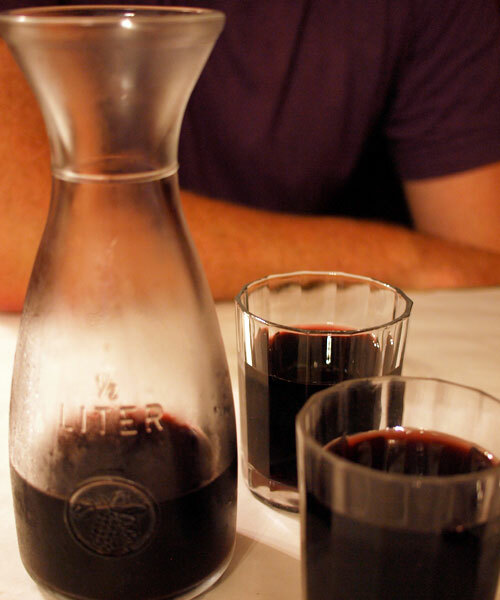 I love the way it’s served in a carafe with little tumblers rather than wine glasses. 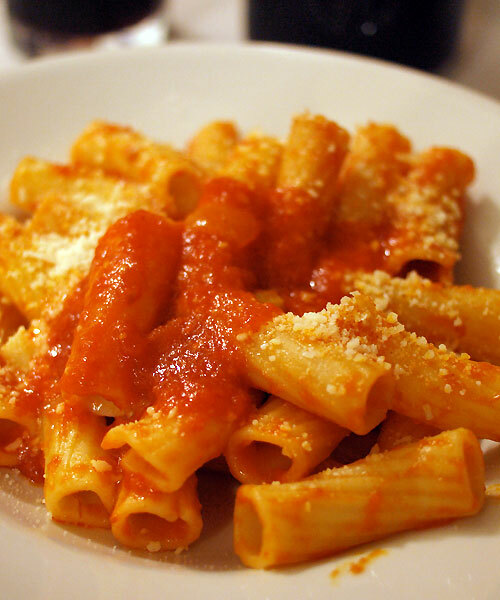 Before we can say ‘bellissimo!’ a big plate of macaroni with fresh tomato sauce and a sprinkling of Parmesan arrives. I should mention now that there’s no menu, you simply eat whatever Ada feels like cooking. Sadly, Alfredo has passed away so Ada and various other family members and friends now run the restaurant. The macaroni was perfectly al dente – they really do cook pasta well in Italy, although al dente is a little firmer than I thought it was meant to be. I actually really like it and will cook it that way from now on. The fresh tomato sauce was vibrant in taste and silky in texture. It had been barely cooked so the tomatoes still tasted very fresh. The simplicity of 3 ingredients cooked perfectly and combined on the plate was pure reverence to the produce. I love that about Italian cooking. We were surprised to get a choice. “Chicken or veal?” said the nice elderly man who was serving us. He had a cheeky smile and no explanation of what either was served with. He didn’t speak much English and we didn’t speak much Italian so we chose one of each. A kind of lucky dip. Where both of us got very very lucky indeed. I had the veal pictured above. Amazing! Braised so well it practically fell apart just by looking at it. 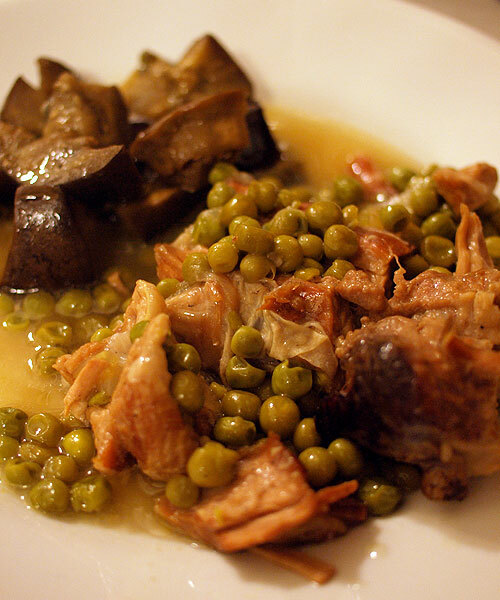 Accompanied by peas and a thin but deeply savoury broth flavoured with rosemary and a hint of garlic. There was also sauteed eggplant that was soft and squidgy and nicely salty. I ate too much white crusty bread while soaking up the juices. It was worth it. Dillon declared this the best chicken he has ever eaten. Even from the dishes I’ve served him. I doubted him until I tasted it and realised it would probably take me quite a while to figure out how to replicate something half as good as this dish. 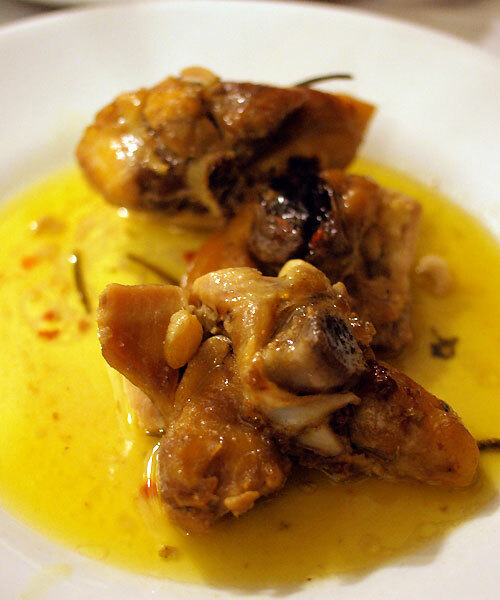 Slices of chicken thigh with the bone in the middle were braised in an oily broth flavoured with rosemary, chilli, garlic and saffron (I think, because of the colour of the oil). It was served with boiled potato chunks smothered in a rich tomato pulp and lots of crusty white bread to mop up all the heavenly sauces. We’d been given the tip to save a bit of red wine for the last course. It was hard to do because the wine was so drinkable and went really well with the pasta and the meat courses. 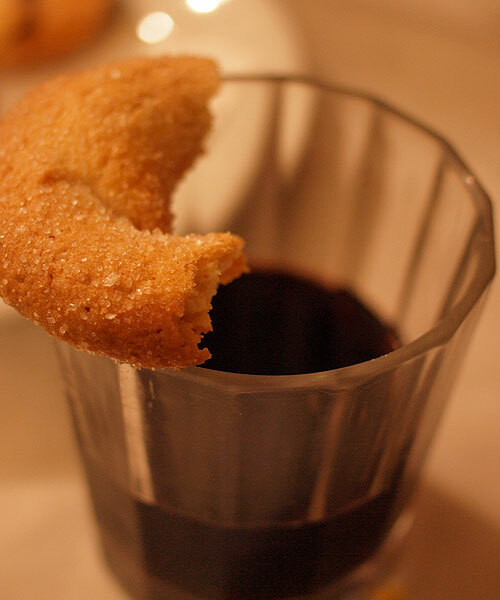 But were really glad we did when these yummy biscotti came out. Not too sweet, although covered in granular sugar, they were the perfect ending to the meal when dipped into the red wine. I don’t think that’s Ada up the back there in the kitchen, but it’s definitely the lovely lady who cooked our meal. If you’re in Rome please check out this restaurant – it’s absolutely delicious and excellent value. ← Where in the world is Christie? What a meal and just what you want your meals in Rome to be! Looks like you’ve discovered a real gem :) And there’s something quite appealing about a place that has no menu and a chef that cooks whatever she feels like cooking! I agree with Lorraine…these are the best types of places to indulge Christie…I loved everything you ate! And I love my pasta extra al dente! Not a huge drinker, but homemade wine? with homemade biscotti? in Rome? Yes please! I love the idea of just eating whatever the nonna feels like cooking! That way you prob get something new everytime you visit, awesome. Hey, great tip! Thanks–might be in Italy next spring, and if I do, I’ll be taking this post with me so I don’t miss the choicest morsels in Rome! I love menu-less places! You know that the food will always be knee-weakening. That chicken looked so yum that I was salivating. It’s a great idea having the cook choose the menu. That way it would never get boring. It’s brilliant that such a simple pasta can taste so good! Sounds and looks so good! do Italians watch their figure at all? @Lorraine – It’s fantastic not having to linger over the menu, trust me! @PeterG – Isn’t (hard) al dente pasta the best? I can’t believe how great it tastes to leave it a little undercooked. @Reemski – I’m not a big biscuit eater, but there’s no way I could refuse! I’m glad I didn’t. @Howard – It seems natural doesn’t it? I mean, you don’t choose what your Mum cooks, she just does it! @Lisa – Please go there, you won’t regret it! @Jen – Yes, add it to your list, you’ll love it! @Arwen – So true! It’s amazing how three ingredients can sing together, very inspiring. After reading your mouth watering post I told my baby brother to head there as he was in Rome at the time. He enjoyed the food and wine and end up hanging out with Ada and Alfredo’s son and his cousins for the evening and had a ball. Thanks for a great recommendation!